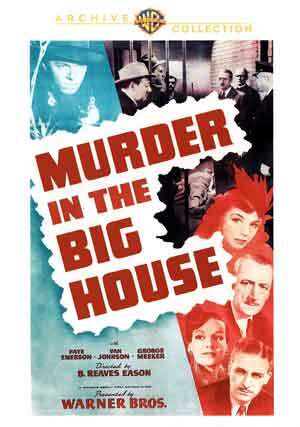 Murder in the Big House is a tight little crime-drama with some fine performances from its lead, particularly Van Johnson and Faye Emerson. When a condemned killer gets fried ahead of schedule thanks to a freak bold of lightning, a trio of intrepid reporters wants to know who’s cheating the chair. Crime reporter Scoop Conner’s (GEORGE MEEKER) suspicions are raised when he witnesses high-society shyster Bill Burgen (DOUGLAS WOOD) promising condemned killer Dapper Dan Malloy (MICHAEL AMES) a reprieve from the governor after Dapper Dan threatens to name names. After Scoop helps Dan get wise, he takes a swan dive into a bottle, leaving news gal Gladys Wayne (FAYE EMERSON) to grab a new guy Bert Bell (VAN JOHNSON) and head to the pen to cover Dapper Dan’s execution. But a lightning strike on death row saves the state the trouble, and all three reporters smell something rotten at work in the big house. The film is presented with a 1.37 full frame aspect ratio and no real surprise this is a sketchy looking with plenty of scratches, dust marks and specs permeating the picture, though some scenes don’t look half bad. The movie comes with a serviceable Dolby Digital Mono track with minimal pops or hisses and outputting clear enough dialogue. Overall, Murder in the Big House is a tight little crime-drama with some fine performances from its lead, particularly Van Johnson and Faye Emerson. This DVD-R release from the Warner Archive Collection has okay video and audio transfers but nary any features in sight.